Huge congratulations on getting highly commended, sweetie! I'm so proud of you! And it's amazing to read that we are so similar - I too am thankful for the blogging comm, especially on Twitter, and in fact I have made some really strong friendships through blogging! It too helped my mental health a lot as it provides a way for me to write down my feelings and discover 'the solution'. Congratulations on the award! Blogging and the community behind it also means a great deal to me. Oh wow what amazing news- congratulations on becoming a finalist, such a well deserved spot! I feel the same way about blogging, the community is just amazing and it's done such incredible things for my confidence and provided me with the most wonderful opportunities! Amazing post Chloe. Blogging can mean SO much to people, like any other job or hobby really. It gets looked down upon but there is SOOOO much good that comes from it! And massive congrats on your highly commended award - so well deserved! You really nailed it there. The difference with blogging is that no one is competing and we all support each other wholeheartedly. I couldn't have put it better myself. BTW a huge congratulations on the award. What an incredible achievement. 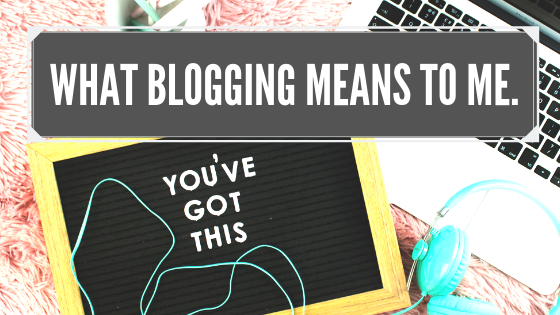 It's so lovely, as someone just starting their blogging journey, that there is such a strong community out there to help! Congrats on the award! You brought up some really good points. I really like the writing aspect of blogging as well.